Traditionally regarded as harbingers of spring in many parts of the country, robins are the most commonly recognized of all songbirds. Members of the thrush family, they are about 10 inches long, with rusty or reddish breasts, gray-brown backs and black heads and tails. Prominent markings include white rings around their eyes, streaked white throats and yellow bills. Females resemble males, but are duller colored. Youngsters have black-speckled breasts. They often flock together to feed on worms under residential lawns, cocking their heads in order to see them better because their eyes are on the sides of their heads. While they breed throughout most of the U.S., robins in the colder northern regions migrate South for the winter. Migrants usually return to the same area the next year, which may be cities, towns, farmland, open woods, orchards, or lawns where their clear, ringing cheerily, cheerily, cheer-up, cheer-up brings joy to winter-weary residents. 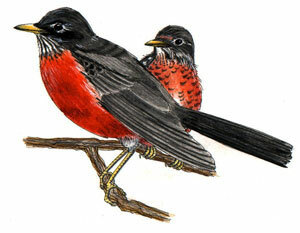 Southern robins tend to stay put year round. Robins are familiar sights all over the nation except for the high plains and areas around the Great Lakes. They are the state Bird of Connecticut, Michigan and Wisconsin.